The story of how a JFK-backed, CIA-led operation to topple Cuban Communist leader Fidel Castro unfolded. And how a decision by JFK changed everything. 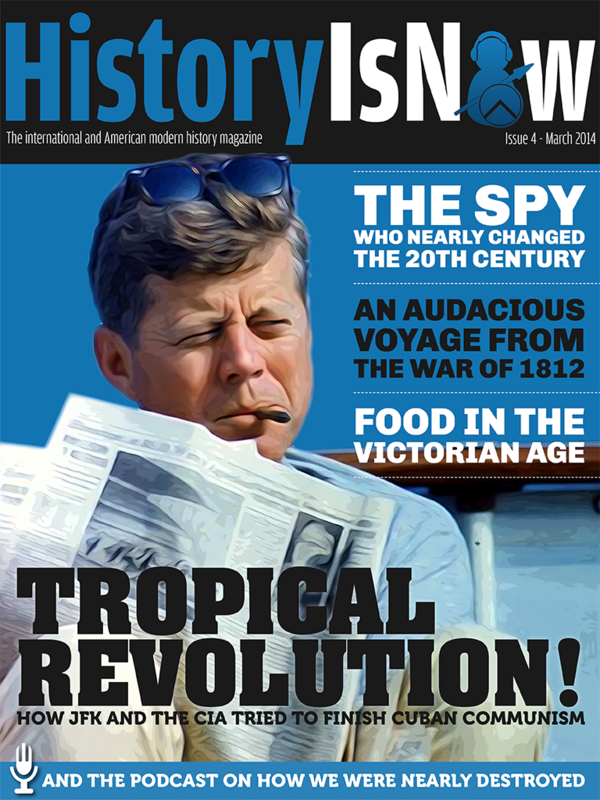 The new issue of History is Now magazine is out now. And the cover story is a daring tale of intrigue in a country that had just been rocked by a revolution. To find out more, take up a free trial of the magazine for up to 2 months and download your free copy of our interactive digital magazine for the iPad and iPhone today! Issue four of History is Now magazine has arrived. Since we left you in January, we have continued to refine the layout of the magazine, as well as writing some great history articles! This month we have two pieces on how Cuba and America dramatically fell out following the Cuban Revolution. Firstly, we look at the fascinating real story of the Bay of Pigs Invasion. This invasion took place in 1961 and sought to topple Cuban Communist dictator Fidel Castro from power. But with US President John F. Kennedy wavering in his support for the Cuban dissidents, this task became much harder. Our second article considers Castro’s rise to power and argues that Castro was not a committed Communist when he visited Eisenhower’s America in 1959. Even so, the US would go on to try and assassinate Castro a number of times. These articles are complemented by our podcast on the Cuban Missile Crisis, an event that very nearly destroyed our world. Then there is the story of David Porter and the USS Essex during the War of 1812, a tale of adventure, some success against the British, and much more. An equally intriguing article looks at the life of Sidney Reilly. Reilly was a Russian-born British spy who successfully changed the course of oil exploration in the Middle East in the early 20th century, and more significantly, almost changed the course of Russian and world history. Following, we finish our story of the Imjin War and look at Yi Sun-shin’s epic victories when faced against a Japanese fleet of epic proportions. This is a true story of success and tragedy – like many of the most captivating events in history are. Our final article takes a light-hearted look at food in the 19th century. What food did the average person normally eat? How did the upper-class dine? And what constituted good manners for a lady? You’re about to find out! Just click here for more information! Alternatively search for History is Now on the app store.